The mines in Cornwall's Gwennap Parish, only a few miles from Falmouth, were once the world's richest source of copper (posting of 27th October). Toiling in these deep mines, the miners endured many hardships, including extreme heat, in certain places well over 40°C. The mines are now long gone, but the heat still remains down there, and modern technology is now being used to exploit that heat, which is generated by radioactive decay of uranium in the granite, which makes the rocks here in Cornwall hotter than anywhere else in the UK. Cornish Lithium is focused on exploring for lithium within the hot geothermal brines that naturally occur deep within and around the Cornish granites. Lithium was first identified in hot springs in 1864 by Professor Miller of Kings College, London, who noted that the occurrence of “so large an amount of lithium” in hot springs could be commercially significant. At that time there was little use for lithium and no method of commercial extraction. Now of course there is great demand for this lightest of metals, and Cornish Lithium is currently evaluating various methods to extract the lithium from the brines. Last weekend I was invited, together with members of the Cornish Institute of Engineers (CIE), to visit the United Downs Deep Geothermal Power (UDDGP) project in the old copper mining district. UDDGP aims to build on the experience and expertise developed during the Hot Dry Rock (HDR) project in the 1980s, which was led by my old friend and Camborne School of Mines colleague Dr. Tony Batchelor. Unlike the previous HDR research project, UDDGP, led by CSM graduate Pete Ledingham, plans to target a permeable geological structure which lies about 800m to the west of the United Downs site. Commencing next week, two deep holes (wells) will be drilled into it; one for injection at about 2,500m depth and one for production at 4,500m. The temperature at the bottom of the production well is expected to be about 190°C. Water will be pumped from the production well, fed through a heat exchanger and then re-injected into the ground to pick up more heat from the rocks in a continuous cycle. The extracted heat will be used to supply a demonstration power plant. Drilling such deep wells in very hard rocks requires a large drilling rig, similar to those normally used for oil, gas and conventional geothermal wells and it is estimated that it will take between six and seven months to drill the two wells, operating 24 hours a day. 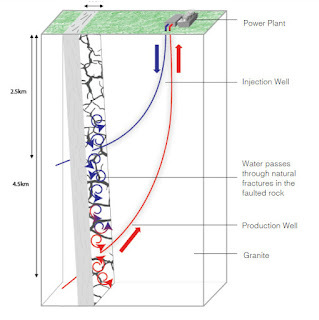 The project aims to prove the technical and commercial viability of generating electricity from geothermal energy in Cornwall, so if the drilling and testing is successful UDDGP will build a small demonstration power plant and supply power to the grid. 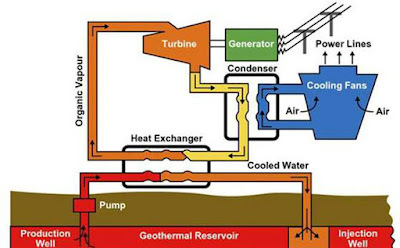 The final power plant design will depend on the testing results and procurement but it is most likely to be a binary power plant, the image below showing an example of this system in which the water from the wells circulates in a closed loop and heat is transferred to a secondary working fluid that drives the generating equipment. Geothermal energy is a clean, natural, renewable and reliable source of energy which is used successfully in many countries. Typically, geothermal power plants have very low or zero emissions and even the very small plant envisaged at United Downs would reduce greenhouse gas emissions by more than 3,000 tonnes per year compared to conventional generation. Geothermal power plants operate more than 90% of the time and are not dependent on favourable weather or daylight. Land use per MW is much lower than other renewables and, in fact, much lower than most energy sources. So if all goes well, we look forward to a further visit to this fascinating project in 2020 with the Sustainable Minerals '20 delegates. Very exciting report and narrative--so much to be done to take the best from what Nature(GOD) has given--understand and benefit for the good of human kind--I am not philosophical but admire the gifts of Nature and challenges to people with parallel thinking. Best wishes for the success of this pioneer project in U.K. The United Downs project is a perfect example of European cooperation. Funding and research and development in the United Downs geothermal project is supported by the European Union. We all hope that this cooperation will continue in the future for the benefit of us all! Fascinating project and I hope the EU funding does not dry up after Brexit. I know little of operations such as this, but have one question. 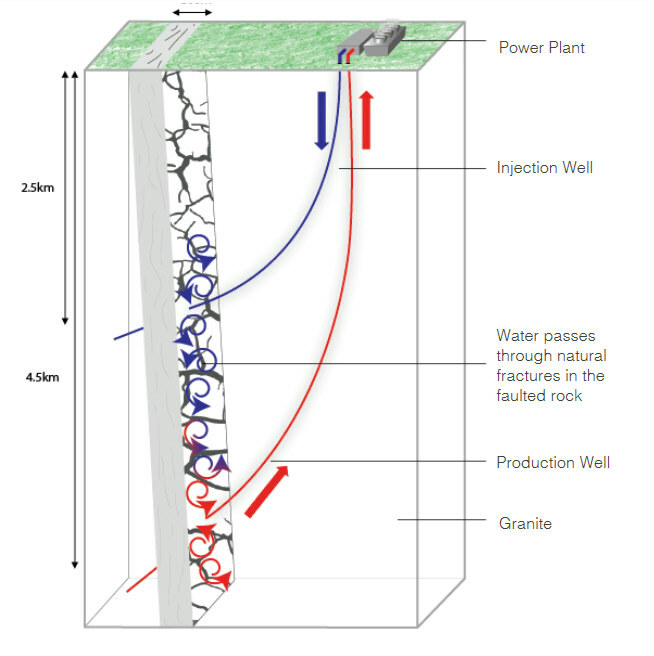 It is easy to see how water can be introduced via the injection well, but how is the hot water raised to the surface through the production well- 4500metres is one hell of a head of water.